The 2018 State of Science Report is now available for download. 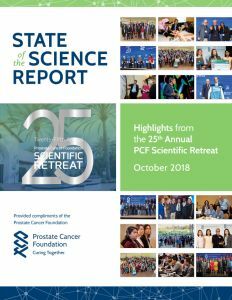 Since 1993, the Prostate Cancer Foundation has been hosting an annual Scientific Retreat that brings together diverse researchers in a collaborative forum to present and discuss new and largely unpublished findings for prostate cancer diagnosis, prognosis, and treatment and to define the challenges that impede progress toward better treatments and a cure. In 2008 we began the tradition of publishing a yearly State of the Science Report and an accompanying scientific publication that summarize the presentations and discussions from the meeting. We hope these reports and scientific publications will be useful to you and will stimulate further dialogue, data exchange, and questioning.